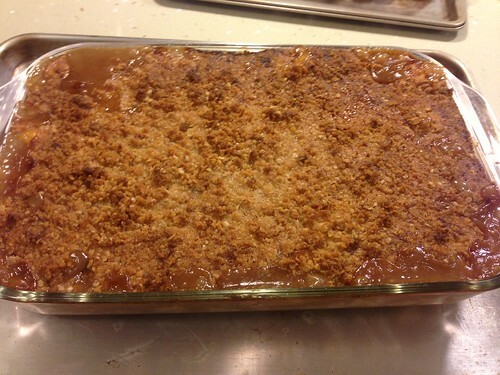 PIC: I made an Apple & Pear Crisp for dessert. Recipe here! PIC: I made an Apple & Pear Crisp for dessert. Recipe here!, originally uploaded by @jozjozjoz. Peel, core, and cut the pears and apples into large chunks. Place the fruit in a large bowl and add the zests, juices, sugar, flour, cinnamon, and nutmeg. Pour into a 9 by 12 by 2-inch oval baking dish. Combine the flour, sugars, salt, oatmeal, and butter in the bowl of an electric mixer fitted with the paddle attachment. Mix on low speed for 1 minute, until the mixture is in large crumbles. Sprinkle evenly over the fruit, covering the fruit completely.